Meet the four ladies on the BWIA flight deck. Not many people associate flying aeroplanes with women, so BWIA International’s four female pilots quietly go about their business without attracting much attention. When they’re spotted moving through a busy airport in uniform, people assume they’re flight attendants. 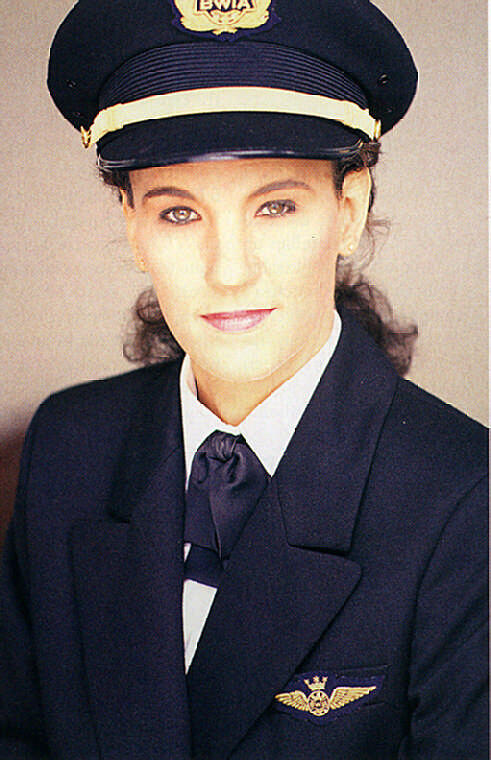 One female pilot reported that during a long Atlantic crossing she walked back into the cabin to chat to passengers, and some of them grew terrified when they realised who was handling operations in the cockpit. On one occasion, a very anxious male passenger had to be allowed to disembark. If Grace Anthony, Wendy Yawching, Deborah Clelland or Anne Marie Lewis had paid heed to this kind of problem, they wouldn’t be flying planes today. But they are anything but thin-skinned. “You get up every morning, check in for work and transport hundreds of trusting passengers from island to island and across continents. It’s a job like any other with its responsibilities,” says Anne Marie. The four come from different backgrounds and took separate routes to the cockpit, though they share a sense of humour that keeps them sane and maintains their balance in the male-dominated world of aviation. Some received parental support. Deborah’s father had wanted to be a pilot himself; from very young she was watching him take flying lessons, so naturally he stuck by her when she chose flying over chemical engineering. Others struck out completely on their own. Wendy worked hard and paid for her own tuition. Grace forged on with her mother’s support while her father did his best to discourage her. Anne Marie’s mother hated the idea of her daughter in a high-risk job, but her father stood behind her. One major obstacle was cost. Becoming a pilot is a very expensive business, and involves training abroad, usually in the United States or England. Even after you gain your commercial flying licence, there are exams to keep the upgrading process going. The path to the Captain’s seat is a grueling one; it can take up to 15 years. Young pilots begin their flying careers as a pilot engineer, monitoring the control panels which report the aircraft’s performance. With BWIA, the plane you begin on is the wide-bodied L-1011, the TriStar. The next grade up is the right seat (the co- pilot’s) on BWIA’s smaller aircraft, the MD83. 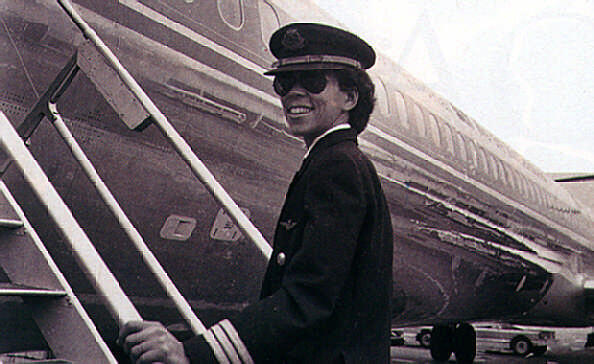 From there you move to the co-pilot’s seat on the L-101 1, then make another jump back to the MD83 as Captain. From there, you’re heading for Captain on the TriStar. Grace and Deborah are pilot engineers on the L-1011, Wendy is a first officer (co-pilot) on the MD83 and Anne Marie is a first officer on the L- 1011. Is it all worth it? For Wendy, planes always held a fascination; once she started taking private flying lessons she was hooked, and loves the feel of controlling an aircraft. “I couldn’t see myself as a ballerina or a teacher or a nurse, all the careers good little girls are encouraged to pursue,” Deborah adds. Despite the early uproars caused by parents and friends who thought the idea of a woman flying a plane was just plain crazy, the girls kept on. Surprisingly, it was mostly other women, not men, as they expected, who had difficulty accepting that a woman could be a pilot. Off duty, Deborah travels widely, always heading out to new and exciting places like Morocco, Australia, Fiji and Argentina. Wendy is an ardent trekker and regularly climbs mountains in Canada and the Alps, even making it to the Himalayas. Grace is a mother who enjoys being close to her kids and husband when she’s not flying. Anne Marie is the youngest of the four and the only one from Tobago. She became a mother for the first time this year and keeps active when she’s off-line, learning new languages or sewing. How do male pilots regard their female colleagues? “Initially there was resistance, but they’re gradually warming to the idea.” Pilots who have daughters are more understanding, wanting to see them excel at whatever they choose to do. None of the girls is treated any differently by the male pilots. “We’re treated as professionals, nothing else.” These women are obviously strong role models for young girls to look up to. They all feel that if you believe in something hard enough, if you believe in yourself, nothing is impossible.